Brittany Me’chel Cotton, originally of Portsmouth, VA [daughter of Billy W. & Marion M. Cotton and the granddaughter of Herlee Adams] and Dexter Jamar Perry Sr. [son of Willie M. & Pamela R. Perry and the grandson of Betty Williams , Lula Mae Christian and Willie Morris Perry Sr.] were united in marriage July 20, 2018 in the Ivory Chapel at Wedding Chapel by the Sea. Rev. Pam Muise officiated. 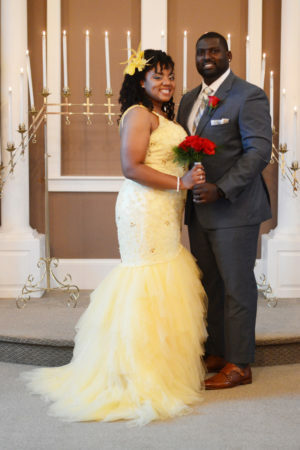 After a honeymoon in Jamaica, the happy couple will reside in Portsmouth, Virginia. We at Wedding Chapel by the Sea enjoyed sharing your special day with you. May the years ahead be filled with lasting joy.